John Jeffrey has been involved in the livestock industry since a young age. Originally from Kansas, he grew up on a diversified livestock operation. Jeffrey completed his B.S. in Animal Science and Master’s in Meat Science at Oklahoma State University. 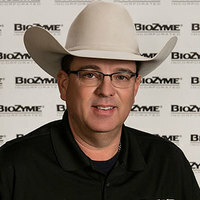 While completing his degree, he was a member of the 1989 National Champion Livestock Judging Team. Prior to joining BioZyme in 2015, Jeffrey was in the pharmaceutical sales industry for 10 years. Jeffrey also spent 11 years working for Cargill as a fat cattle buyer. Jeffrey lives in Stillwater, Oklahoma, but is involved in his family’s cow/calf operation in Wilburton, Oklahoma. In his free time, he enjoys roping and cheering on the Oklahoma State Cowboys.